A Change.org petition which calls for the regulation of political advertising has gathered 100,000+ signatures in the 4 days since it launched. 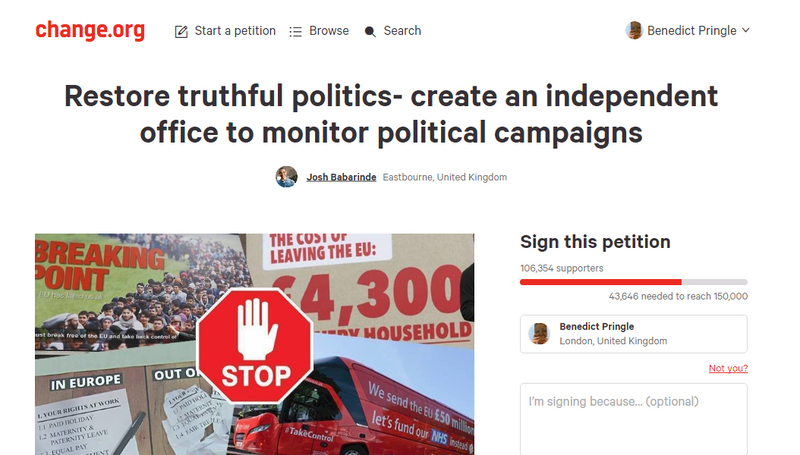 The petition was posted, by John Babarinde from Eastbourne, in response to some of the political advertising that ran during the EU referendum which he felt was clearly and deliberately misleading. 100,000 signatures might not seem like a vast number, but take it from someone who spends too much time pouring over the visitor statistics of a niche political advertising blog – this is significant! Whenever I bore on about the need to regulate political advertising the reaction is usually along the lines of “ok maybe there’s not specific legislation, but I’m sure there’s a parliamentary committee or division of Ofcom (or something) that keeps an eye on these things”. “In general, political campaign material in the UK is not regulated, and it is a matter for voters to decide on the basis of such material whether they consider it accurate or not. This includes the design of the material. There is one exception to this, which is making or publishing a false statement of fact in relation to a candidate’s personal character or conduct (not their political views or conduct), unless there are reasonable grounds to believe the statement is true. The Commission does not regulate this rule however, and any allegations should be made to the police. In short: if you want to complain about the content of a campaign’s advertising you can only do so with your vote at the ballot box (or your chuntering on social media). The current lack of regulation means that campaigns are free to make wild and unsubstantiated claims, such as Vote Leave’s headline slogan which promised £350 million worth of savings from the public purse if the UK voted to leave the EU. The extent to which Vote Leave were aware that the £350 million claim was untrue prior to polling day can be seen when Matthew Elliot, CEO of Vote Leave, appeared before the House of Parliament Treasury Committee on 9th May (watch here from 14:45:20). His justification for the figure is paper-thin and so poorly argued that it’s as close as you can get to an acknowledgement that it’s a fabrication. And Chris Grayling MP, a leading member of the Vote Leave campaign, only a few days after the conclusion of the referendum, admitted that the figure was only “an aspiration”. The Remain campaign aren’t remotely exempt from criticism. Apart from anything else, the name of the official campaign – Britain Stronger in Europe – is misleading as the referendum was about European Union membership and not the question of whether the country would remain part of Europe. The decision by Remain to continually refer to remaining in ‘Europe’ and not the ‘EU’ was deliberate and designed to escalate the discussion from one around a political and economic union to one of cultural identity. False claims made during the campaign reduce the moral authority of the result. Untruthful assertions in political advertising perpetuates voters’ lack of trust in politics more generally. Lies from one political group dilutes the contentions of every political group (even ones that tell the truth) and debase the campaign discourse. It brings advertising more generally into disrepute as the public might fairly assume that commercial messages are similarly unscrupulous (when they are in fact carefully regulated). It puts media owners in a difficult position when there’s public outcry about the content of political ads as they have to decide for themselves whether to drop the advertisement (risking infringing on freedom of speech legislation in doing so). The CAP felt that either political advertising should conform to all of the ASA’s normal advertising standards or none. A 2003 Electoral Commission report into the issue opted for ‘none’. Given the history of the issue, I don’t think for a moment it will be will be easy (or even possible) to create a perfect regulatory solution. But the status quo, where the Electoral Commission, the ASA, the Houses of Parliament, Ofcom and any other body you might care to name refuse to take responsibility, is unacceptable. I don’t advocate reducing political organisations’ ability to make powerful or controversial claims. Nor am I subscriber to the belief that campaigns should be ‘positive’. I’m not even suggesting that those elected should be held accountable to promises made in their advertising at election time. It’s just very clear to me that there should be a formal process that enables citizens to challenge claims – often positioned as facts – made by political campaigns which they feel to be untrue or misleading. To use a well-worn political advertising refrain: it’s time for a change.